Please refer to the instructions issued vide Board’s letters No. 2008/AC-II/21/19, dated 29.05.2009, No.2010/AC-II/21/18 dated 02.07.2013 and 13.07.2010, letters of even number dated 08.09.2014 and 13.01.2016 on the above mentioned subject. 2. Now, one of the recognized Federations (NFIR) have again raised the issue of non-compliance of the above instructions by Zonal Railways and reluctance on the part of Railways in providing additional relief to the widows of NPS subscribers/ NPS subscribers who have been declared invalidated. The Federation have also stated that Zonal administrations are not taking initiatives to ensure additional relief in terms DOP&PW’s D.M. dated 05.05.2009 and that they are reluctant in providing additional relief on death and disability of NPS subscribers. 3. It is once again reiterated that the aforesaid instructions may be followed scrupulously and to review all the cases for ensuring the payment of family pension, disability pension and extra-ordinary pension to the NPS subscribers in case of death/disability. Further, Zonal Railways are also advised to sensitize the administration at lower level towards the problems faced by the employees and their families. 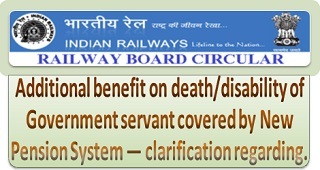 Railway Board Clarification dated 23.08.2017 on Additional benefit on death/disability of Government servant covered by New Pension System.